Shrewsbury will have to wait for promotion after they suffered defeat by fellow promotion hopefuls Bury. After a cagey first-half which saw no shots on target, the Shakers took the lead when right-back Joe Riley smashed an unstoppable shot in from 30 yards. The visitors responded but Mark Ellis's dangerous header went across the face of goal without a telling touch. 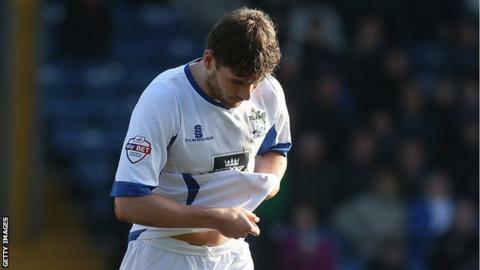 Andy Mangan saw a goal ruled out as Bury weathered late pressure to secure themselves a play-off spot. Shrewsbury could have confirmed promotion to League One had they secured victory, and Southend not won against Newport County, but will now have to wait. Meanwhile Bury, who have a game in hand, are four points from third-placed Wycombe, who managed a dramatic late win against Exeter. Match ends, Bury 1, Shrewsbury Town 0. Second Half ends, Bury 1, Shrewsbury Town 0. Foul by Tom Eaves (Bury). Cameron Gayle (Shrewsbury Town) wins a free kick on the right wing. Attempt missed. Liam Lawrence (Shrewsbury Town) right footed shot from outside the box misses to the left. Chris Sedgwick (Bury) is shown the yellow card. Liam Lawrence (Shrewsbury Town) wins a free kick on the right wing. Danny Mayor (Bury) is shown the yellow card. Substitution, Shrewsbury Town. Mikael Mandron replaces Cameron Gayle. Andy Mangan (Shrewsbury Town) is shown the yellow card. Attempt missed. Kelvin Etuhu (Bury) right footed shot from outside the box is close, but misses to the left. Mark Ellis (Shrewsbury Town) wins a free kick on the left wing. Substitution, Shrewsbury Town. Tyrone Barnett replaces Keith Southern. Bobby Grant (Shrewsbury Town) is shown the yellow card. Corner, Shrewsbury Town. Conceded by Joe Riley. Substitution, Bury. Tom Eaves replaces Daniel Nardiello. Corner, Shrewsbury Town. Conceded by Andrew Tutte. Attempt missed. Keith Southern (Shrewsbury Town) left footed shot from outside the box is too high. Goal! Bury 1, Shrewsbury Town 0. Joe Riley (Bury) right footed shot from outside the box to the top left corner.